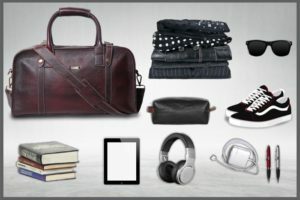 Today in this article you will discover the maroon leather travel duffel bag features and specifications in detail. Let’s take a look. The maroon leather travel duffel bag is a full green leather bags, which is available on Thestruttstore.com, It is deep warm maroon and black coloured with the mettle finish. The bag is smooth but not gives you a oily or waxy feeling. 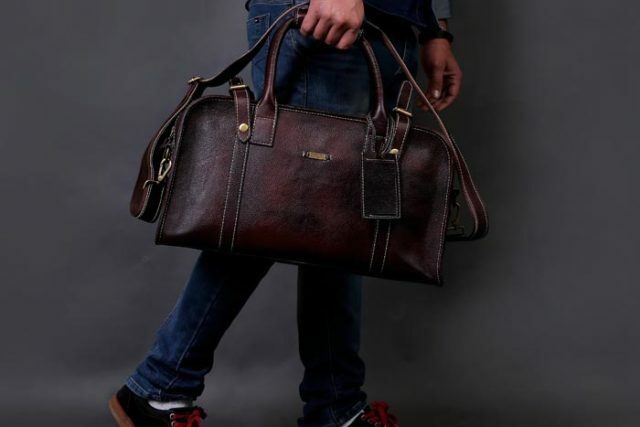 This bag I received from the website looks 99% perfect as far as the leather is concerned, this duffel bag has rolled and stitched handles, and can be hanged on shoulders as well by attaching the included adjustable leather shoulder straps. when I unboxed that maroon Leather Travel Duffel bag, the fragrance of leather literally punched me. Unlike, many leather bags smell like they were drenched in a wet of chemicals, but this bag really impressed me with it smell, I advice to consider this bag if you are looking for a great leather house for your laptop. I liked the designing of this back at first glance, this maroon leather travel duffel bag reminds me, that I made a great decision of buying this bag, as of now. This bag has genuine leather with hot locking mechanism, that is enough to store your clothes, shoes and toiletries. I am using this bag for a long while and its highly durable, as far as the quality is concerned, it hundred percent satisfied me with its splash proof material. This handcrafted laptop briefcase has unique shade of maroon and black along with waterproof lining. This bag is perfect for your laptop, it has many bits and buckles along with three inner pocket and one outer pocket. The best part of this bag, which I liked the most is, it suits both men and women. This duffle bag does not have a lot of branding on it. In front of the main buckle it just has a small stamp of Thestruttstore. One can completely satisfy their expectations towards the new travel duffel bag in leather material. If You flip the background and look at its back, then still it has an attractive look along with the logo of brand and a large open top pocket that can hold flat items like folders, magazine newspaper, , books , etc. The best part of this bag! The pocket of the bag has about 7 inch tall and 13 inches wide. And if you ask about the leather that can be seen at the bottom of the duffle bag, it keeps the bags base lifted up of the floor to help keep it clean. There are many folded rings on the bottom of the bag to make it look more professional. This amazing maroon and black combinational adjustable shoulders straps bag really helped me while I travel around, if you are a freelancer or traveller than i suggest this bag, should be your first choice among the available options in the market. 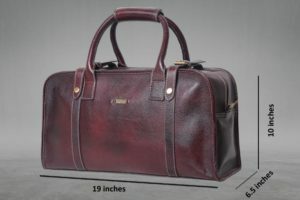 This Maroon leather travel duffel bag can be adjusted to fit almost any size including height challenged to tall people. Unlike the other duffle bags this bag has a really cool way to secure the contents of the bag, along with your laptop. 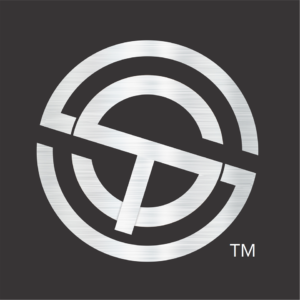 Reasons to buy from The Struttstore! Thestruttstore.com gives its warranty for 100 years, and they are confident enough about this bags quality, that it can stand the test of time and I can’t disagree with that. As this company makes gorgeous leather bags and deliver them on time. If you do have a budget for good quality products then you must enjoy caring this Maroon laptop Briefcase.